The Twin Cities freeway system, like many places, is designed so everyone who wants to use a freeway can do so on-demand by showing up and getting on the road (or queueing at a ramp meter waiting for the opportunity). 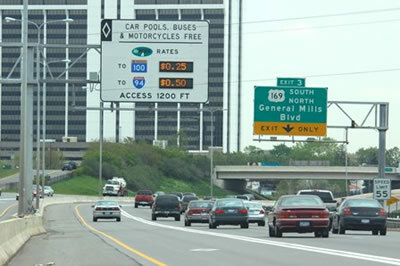 The Twin Cities also has a MnPass system on some of its freeways, which it plans to expand. 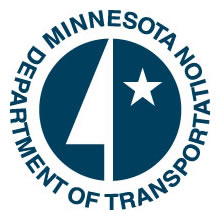 The MnPass High Occupancy/Toll (HOT) lanes guarantee free-flow travel times, but have tolls which vary systematically over time-of-day (rising during the peak period), or in modern installations, dynamically. In the case of dynamic tolls (like MnPass), they are intended to ensure the toll is high enough to prevent congestion (ensure the level of traffic is far enough below capacity that bottlenecks are not activated, and if temporary queues are formed they are quickly discharged.) However with the dynamic toll, travelers don’t know what it is until they are about to decide between using the priced lane or not. (It is capped at $8.00, but the price has variability). Almost everywhere else, we guarantee the price on a road ($0) with variable travel time. We thus have either uncertainty on price with certainty on time, or certainty on price and uncertainty on time. We should be able to have certainty about both of these, assuming we allow the price to be non-zero. First-come, first-serve is not the only way to allocate space. We don’t allocate table space that way during prime time at nice restaurants. We don’t generally allocate airline seats that way. We don’t have to allocate roads that way. We could, for instance, have reservation pricing (which has been proposed for intersections in a real-time way). At its most basic level, for instance, every day the commuter pre-purchases a ticket to use a particular road segment (e.g. between exit 400 and exit 401) during a particular time slot (say between 7:45 and 8:00). The ticket cost is known in advance before departure, like a plane ticket. The road agency would only sell as many tickets as the road would accommodate (without congestion) at that period. The ticket would be validated electronically through some form of Electronic Toll Collection. But, roads are not like airplanes, the traveler might arrive at 7:44 or 8:01, does the road agency force the car onto the shoulders? More likely they just charge a penalty which increases with deviation from the purchased window. So if the charge were $2, there might be a $0.10/minute surcharge added for each minute early or late the traveler was. If the system were deployed universally, congestion would be a rarer occurrence (seeing only non-recurring congestion, due to crashes and other incidents, not the daily recurring congestion because of excess demand for the available capacity). Further the system would know whether the traveler or the agency was the caused the earliness or lateness. If there were non-recurring congestion, it might waive the penalty. If on the other hand the traveler left too early or too late to reasonably make their slot under planned for circumstances, the surcharge would stand. But travelers don’t want to map out their route every day. OK, the agency can probably just sell a ticket allowing travelers to be “on the roads” (as opposed to being on a specific road), and let individual travelers sort out the best path. The losses from not micro-managing spatially are relatively small, compared to the gains from spreading traffic out by time of day. See the literature on Macroscopic Fundamental Diagrams about this. In this case, the traveler pre-purchases a ticket to use any metropolitan area road between 7:00 and 7:30 am, but the number of passes is limited by system capacity. If purchase is made far enough in advance there is a lower price then if the ticket is bought real time. But no-one wants to plan their schedule that far in advance, or log-in daily spending even 5 minutes to buy tickets for a 20 minute trip. Here the road agency managing the system can be a little bit more clever. They could sell various types of season passes (just like transit agencies). A traveler might buy an unlimited use pass for a premium, but there would be a limited number sold to residents of each zip code (if spatially fixed, passes would not be transferrable, the electronic transponder would be linked to a license plate) (or any other local geography that makes sense, the key is there is still finite space on the roads, and too many pass-holders from a wealthy suburb won’t save time just because there is excess capacity elsewhere). Or they could buy a more limited use pass at a lower price. And of course, travelers would buy these as recurring subscriptions, billed to a credit or debit card. People without passes could take their chances with same-day tickets which might be more expensive if traffic is on the edge of congestion, or cheap if traffic is low that day. If set up properly, these passes replace existing revenue sources for the agency. How should the agency allocate these passes? Clearly it should not just give them away. But setting a fixed price and selling them does not real allow discovery of demand patterns. Here Dutch or Vickrey auctions might be appropriate. For instance, the passes would be available at a posted price (‘buy-it-now’), but the agency would also accept lower bids. Suppose there were 100 passes, there would be a bidding period, and at the end of the period, the top 100 bids would win and the price would be set at the willingness to pay of the 100th bidder. There are many variations on auctions, which each have advantages for buyers or sellers in terms of maximizing revenue or price discovery or fairness. If you have been following this blog, you may have detected a theme, I don’t like the public wasting money on un-needed infrastructure. Of course no-one endorses “wasting” money, we just disagree what is wasteful and what is an investment. I think the answer is obvious in retrospect. A successful investment had a positive “return on investment” at or above market interest rates. An unsuccessful investment (or waste) had a negative return on investment. Projects with positive but below market rates of return sit in an analytical purgatory. In prospect, I think I can assess forecasts accurately, and project advocates are not to be trusted for a variety of well-understood reasons ranging from optimism bias to strategic misrepresentation. Unfortunately, other people also think they can assess forecasts accurately, even if we know they can’t. If we had better mechanisms for requiring forecasters to be more accurate, we could mitigate these problems. When these projects are small, it is not terribly important. The analysis of benefits and costs should not be costlier than than the benefits from the analysis (i.e. the difference in total welfare from a build/no build or a build this vs. build that decision). But when the project proponents ask for hundreds of millions of dollars (or more), we should be paying more attention. A large number of projects seems to fall in the category of what I will dub “Mostly Empty Syndrome”. MES projects are infrastructure that are underutilized. Mostly they are not underutilized by design, but by mis-forecast. There are facilities however, like NFL stadiums, that are in fact underutilized by design, with lots of marginal events schedule to mitigate the grossness of the structure. Vikings Stadium – As I suggested before, they really only need to play in a TV studio. More importantly, the facility is unused or underutilized 355 days a year. The worst aspect is that they could not somehow figure out a way to share the stadium with the college team at a university that is adjacent to the stadium site. Stillwater Bridge – The old bridge required a replacement. The new bridge is overkill for the actual demands on the road. SPUD – It is basically slated to serve 350 train passengers a day, and a few buses until lots of speculative rail lines are opened. Northstar – Some forecasts greatly over-estimated benefits. Maryland’s Inter-County Connector is failing to realize forecasts of demand. There are some counter-examples perhaps, projects that were long considered white elephants, though eventually demand caught up with supply. Dulles Airport meets this criterion. That still does not mean it was a good idea to build it when it was built, even if it is heavily used today. The 20 years of underutilization are fixed capital that could have been better spent in some other way. There are other counter-examples, projects that were expected to fail (by someone, though not by proponents) that exceeded expectations. The Pennsylvania Turnpike comes to mind. I believe history will show that they are designed and pushed through by politicians serving narrow interests rather than by market demands or public sentiment. That is, they are generated by top-down rather than bottom-up processes. They are large and require special treatment. They are backward looking, built near, at, or past the maturity of the technology they represent. Air travel was still growing when Dulles was built, and the market grew into its capacity there. Auto travel was still early in its cycle when the Pennsylvania Turnpike was built. In contrast we now have peak travel, long ago passed peak railway, and are hopefully at peak football. I was at a public forum in Hinckley, Minnesota last night (home of the world-famous Grand Casino), giving a talk on the Northern Lights Express (NLX). The crowd was, in the immortal words of Grampa Simpson “Agin’ it”. My slides are here, though readers of the blog have seen most of the material before. It was fun, thanks to the many organizers from Pine County. Washington Avenue has been covered extensively on Streets.MN already, so I won’t go further into that now. The others are the Star Tribune site and the Stadium. 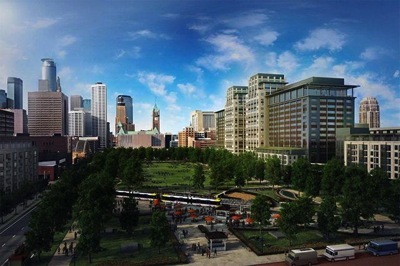 The Ryan proposal for redeveloping the Star Tribune site is the best of the bunch, and their renderings are also much nicer. The “Yard”, as the park on the site has been dubbed, does a few good things. It takes developable land off the market. This makes the remaining land more valuable. It provides an amenity for the remaining parcels. One of the beautiful things about parks from a city planning perspective is that no one demands a Benefit/Cost analysis on parks, since the benefits are thought to intangible. In fact they are capitalized in land values. It replaces surface parking lots. 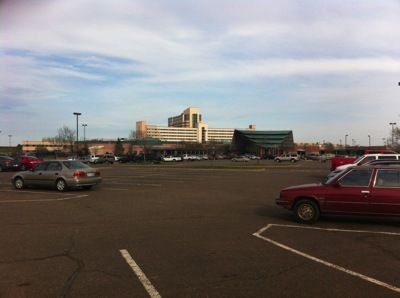 It creates a mall or Central Park for the neighborhood, mall-like in that it one end is dominated by a large structure. In this case it is a Vikings Stadium rather than the US Capitol Building. The idea is the same, we pay taxes to the occupants of the respective buildings. It creates valuable redevelopment opportunities for the Morgue, the Juvenile Detention Center, and the Hennepin County Public Safety Facility (and the Stadium in 20 years). These should enrich public coffers. It puts “tailgating” to rest, unless they allow tailgating inside parking ramps. Football fans will have to picnic instead. It builds a new parking ramp at Park and 5th. To be fair, this is because of the Stadium. And the location, adjacent to the stadium, HCMC, and the JDC is hardly a pedestrian paradise now or in the future anyway. Hopefully they can do something with the ground floor to keep it active, as it is adjacent to an LRT. It is also well placed given it has almost immediate on and off-ramp access to I-94 to the East. I think it would be better to put the parking ramp under “The Yard”, but I realize subterranean construction is costly. It makes the LRT station look like a scar on the landscape. If they eventually split the Blue and Green lines (not yet in anyone’s plans, but necessary if there is demand to increase service frequencies on either line), or put them below grade, this scar will go away. That is many years away. I think it nets out as a good thing given the existence of a large stadium at one end. Closing Park and Portland are far more feasible than closing 4th St or 5th St. It reduces some vehicular access to the Mill District from the South (and Eliot Park from the North), and goes against the aim for better connectivity. On the other hand, reduced connectivity will reduce total vehicular travel (which is a good thing from an environmental perspective, and a bad thing from an economic activity perspective). Some have suggested that they just be closed part time, e.g. during events, and be shared space the remainder of the time. Others have suggested they stay closed, just like in Central Park. Nevertheless, the effects here will be relatively small. The issue of “Wells Fargo” as a tenant is interesting. Presumably this is just a consolidation for them, as they already have facilities in town, so would just create vacancies elsewhere. Good for downtown, bad for the owners of the older space elsewhere. A win for the city would steal business from another city (which is still just a transfer). A win for society would be the growth of new business. Also there is a certain irony in that this would be the mortgage division, which got into trouble in the last building boom by over-financing new construction. Well aside from not liking the idea of the Stadium, and its location in downtown being a strategic error on the part of the city and state’s political leadership, it could be worse. I am not as pessimistic on it as Nate. This is an improvement over the Metrodome from an aesthetic perspective. The glass facing West and South will be iconic, though a bit starchitecture-like. That it turns its back to the North and East makes sense given the land uses in place there (a freeway entrance ramp and LRT tracks). Yes it forecloses the opportunity to do something better there, but that wouldn’t be happening anyway, this is Minneapolis not Manhattan and there is just not the demand now (or for the next 20 years) to do something with good urban design in these forgotten marginal spaces, there are still too many better sites. Yes I would like more glass and less wall, but I am sure that costs money. Like the Saints Stadium in St. Paul, it is wedged into a corner backing onto the transportation network and fronting the city, that they don’t do anything with the back is no great loss. 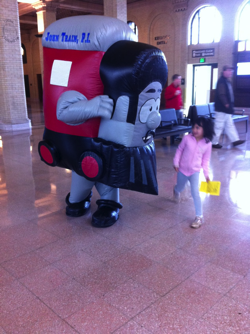 This post will be unpopular.I went with my family to an event for National Train Day (as suggested by a recent post by Julie). We drove to St. Paul since the Green Line is not yet open. Driving is break-even with paying for 3 fares on the bus round-trip, and my once non-driving, Amtrak-riding wife wouldn’t take the bus anyway. Free parking in St. Paul is a little tricky to find on Saturdays now, but fortunately, the new Saints Stadium construction has not started and the free Farmer’s Market parking at the old Gillette plant is still open, so we parked there and walked a few blocks through the early season market, passing mostly preserves and garden plants, to the station. We entered the dimly authentically-lit Saint Paul Union Depot (SPUD), a large but not magnificent space. A train station with no trains. The restoration is nice, and I am sure a better space than the restorers found it in, but the original structure was really nothing special at all. Having only been to the front of the station previously (the acoustically challenged headhouse), I was actually disappointed at the rest of it given how much fuss and money have been expended on the project. The money spent on the restoration was $243 million, one-fourth of the cost of an LRT line serving 100 to 200 times as many people per day? Okay, it’s still better than a Vikings Stadium, but is that really the bar for public investment? We should always ask what else ‘we can get for that money’ given that our wants outstrip our wallets. The building was perhaps constructed at the nadir of American railway architecture, missing both the Belle Epoque ornamentation of the 19th century, and the Art Deco of just a few years later. Instead going for the stern and spartan neoclassical style reflecting, if not appealing to, the sensibilities of pragmatic upper Midwesterners. It is “considered to be one of the great architectural achievements in the city” sayethWikipedia. That does not speak well of the city, and I believe a false claim. Off the top of my head, I would rate the Cathedral, the Capitol, and the Science Museum significantly higher on the list. Frankly among transportation structures, I would rank Bandana Square higher on the list. And this is all leaving aside what has been destroyed. It is nicer than the Midway Amtrak station it will eventually replace. As we entered, to our left some early twenty-something lady DJs for the Disney radio channel (apparently Disney has a radio channel) were trying to encourage some youthful dancing to popular music. They were getting no custom. Christo’s restaurant was also mostly empty, though one of the waiters was dancing with the DJs. There was an Amtrak swag area farther in, with a longish line for stuff. The entire St. Paul rail fan apparatus was in place: from Choo Choo Bob’s, to the Twin Cities Model Railroad Museum, to the Minnesota Transportation Museum, to the NLX booth (with a brochure promising “profits” from their line), to the rail passenger association with a lot of lines drawn on a map of Minnesota. Red Rock’s booth was not manned (just like their trains). The big attraction was the bouncy house and the bouncy slide. 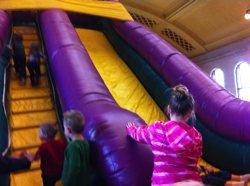 The Slide was manned by a security guard, to make sure the kids didn’t pass each other climbing up the inflatable slide, which could be hazardous. At the end of the Depot was a sign advocating free train rides. We went downstairs. They were fake trains. Okay, to the extent that one motorized vehicle pulling a trailer is a “train”, they were trains, but they were untracked, not steam, diesel, or electric powered, small, and ran on the platform, not the rail. They couldn’t even get the transportation museum to operate a short-line run of one of their tour trains at the Jackson Street Roundhouse. The small train was nevertheless full, carrying a load of about 10. Needless to say, the children were displeased. I had to promise a real train ride soon. Blue Line here we come. If we want to steal ideas from other cities, some thoughts for adaptive reuse for this future pale proboscidea include: An Exploratorium, anaquarium, a planetarium, an indoor market. I am sure there are others. 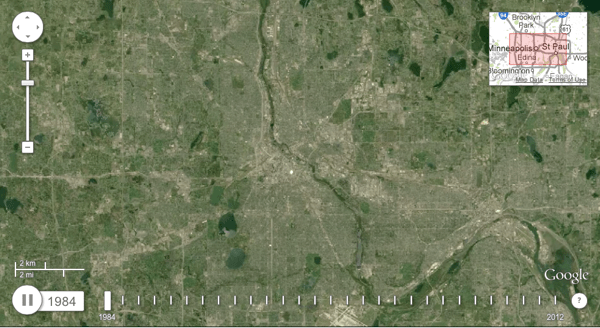 Google Earth Engine lets you see the evolution of Landsat photos. Congratulations to soon to be Dr. Carlos Carrion (shown in the center of the picture, between alums Nebiyou Tilahun and Pavithra Parthasarthi), who recently defended his Ph.D. Thesis “Travel Time Perception Errors: Causes and Consequences” (a draft of which is linked). 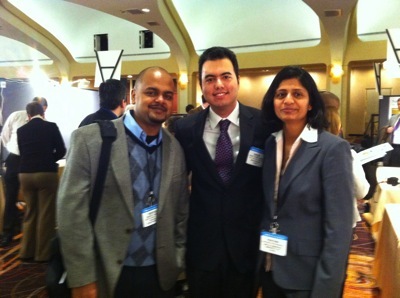 He is working as a post-doctoral researcher at MIT/SMART in Singapore. This research investigates the causes, and consequences behind travel time perception. Travel times are experienced. Thus, travelers estimate the travel time through their own perception. This is the underlying reason behind the mismatch between travel times as reported by a traveler (subjective travel time distribution) and travel times as measured from a device (e.g. loop detector or GPS navigation device; objective travel time distribution) in collected data. It is reasonable that the relationship between subjective travel times and objective travel times may be expressed mathematically as: Ts = To + ξ. Ts is a random variable associated with the probability density given by the subjective travel time distribution. To is a random variable associated with the probability density given by the objective travel time distribution. The variable ξ is the random perception error also associated with its own probability density. Thus, it is clear that travelers may overestimate or underestimate the measured travel times, and this is likely to influence their decisions unless E(ξ) = 0, and Var(ξ) ≈ 0. In other words, travelers are “optimizing” (i.e. executing decisions) according to their own divergent views of the objective travel time distribution. 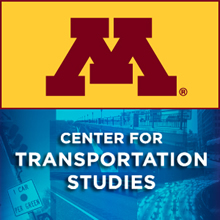 This dissertation contributes novel results to the following areas of transportation research: travel time perception; valuation of travel time; and route choice modeling. This study presents a systematic identification of factors that lead to perception errors of travel time. In addition, the factors are related to similar factors on time perception research in psychology. These factors are included in econometric models to study their influence on travel time perception, and also identify which of these factors lead to overestimation or underestimation of travel times. These econometric models are estimated on data collected from commuters recruited from a previous research study in the Minneapolis-St. Paul region (Carrion and Levinson, 2012a, Zhu, 2010). The data (surveys, and Global Positioning System [GPS] points) consists of work trips (from home to work, and from work to home) of subjects. For these work trips, the subjects’ self-reported travel times, and the subjects’ travel times measured by GPS devices were collected. Furthermore, this dissertation provides the first empirical results that highlight the influence of perception errors in the valuation of travel time, and in the dynamic behavior of travelers’ route choices. Last but not least important, this dissertation presents the most comprehensive literature review of the value of travel time reliability written to date. The League supports HF 745 (Erhardt, DFL-Edina) and SF 607 (Carlson, DFL-Eagan), legislation that would allow cities to create street improvement districts. This authority would allow cities to collect fees from property owners within a district to fund municipal street maintenance, construction, reconstruction, and facility upgrades. If enacted, this legislation would provide cities with an additional tool to build and maintain city streets. Sounds like a good idea to me. To be fair, there are opponents. The stated opposition seems odd. They oppose this tool because it is not voter approved, yet I don’t ever recall voting on property tax hikes, or sales taxes for stadia which are imposed on me. The real opposition is because it shifts the burden from one class of taxpayers to another, hopefully so that it is more closely aligned with benefits. Drew Kerr has a pay-walled article at Finance & Commerce here.